Two shipments of Windsurfer One Designs are coming from Australia this spring. One is going to Dallas, Texas and the other to Traverse City in northern Michigan. Between these two locations we'll be able to ship anywhere in North America. 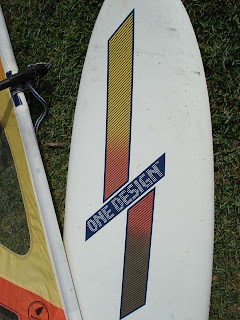 This is exciting news because there hasn't been a new Windsurfer One Design on this continent since the mid 80s! Can you guess who'll be first to sail a shiny new board? I am hoping it will improve my sailing speed because I think over the years my "wally" seems to have put on a few extra pounds. I plan to get another 25 years out of my new one. Check out the website for prices or email me your interest. I also have SUP paddles - I've had a blast SUPing on my One Design before & after the wind picks up. I had some airline miles accumulated so I'll be competing in the CHIA CLASSIC on the Italian island of Sardinia the first week of May. This Pro-Am Waterman event has it all, including a Windsurfer 'Revival' competition with international teams of 3 racing country against country, and one-on-one match races. There's also Kitesurfing, SUP race and more. If you need to use some airline miles, I can't think of a better way -this will be a fun trip. Check out this Event on the Original Windsurfer FaceBook page in the "Events" section to learn more, or download the Notice of Race from the site. 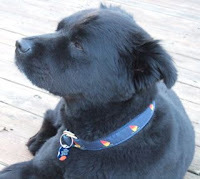 Next I'll be loading Roscoe, our dog (see him there to the right, he REALLY likes c-a-r rides) and a couple of Windsurfer One Designs in the VW van this summer and visiting regattas and events around the Great Lakes (and maybe further...). I am still planning my "tour" schedule, so if you want to try a new Windsurfer One Design or already have a board and want a sailing buddy or need another Windsurfer on the start line, let me know. My base camp will be Traverse City, Michigan, so I am pretty close to Canada too eh. WINDSURFER "DINO" RACE AMERICAN CHAMPIONSHIPS: No this isn't code for an extreme seniors race, but this event has been running for a long time! The 13th annual Dino Race is a one day Championship held the last Saturday in September 2010, outside Houston, TX. Super fun crew of Windsurfer sailors, relaxed and beginner-friendly atmosphere...and there's a party barge! email seaycook@comcast.net for more info. Held with the Kona World Championships, the first week of November 2010 in Miami, FL. This will be the first event to combine Kona One Design course races with Windsurfer Freestyle & Slalom competition. Come for the entire event and experience world class competitive one design course racing on Konas combined with the disciplines of a fun freestyle and slalom championships on Windsurfers. These events will be held on the beach in South Beach, Miami so it's going to be a fun time no matter what happens. Register early. I've read & heard a lot about the Konas and I am excited to get on one. Windsurfers will be provided free of charge, and Kona boards can be chartered for the week. Register early. For complete info see the Notice of Race. 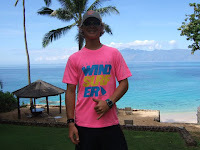 note: all Notices of Races are also available at Original Windsurfer.com in the "Downloads" section. 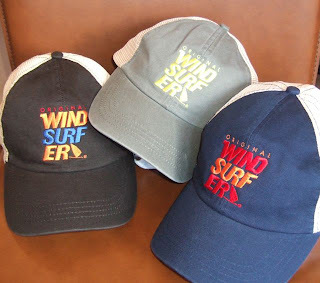 New gear: Soft mesh caps and washed (neon) Wind-surf-er shirts to help get in the spirit, see more.